Stan Rosenthal, FWF Forest Advocate, is available to assist landowners that want to plant/manage longleaf in the Panhandle! Contact Stan at stan@fwfonline.org. The Florida panther, with its long-tailed and pale brown fur, is a symbol of wild Florida. This cat once roamed across the entire southeastern United States, but human population growth has, and continues to, destroy, degrade, and fragment their habitat. Today, the U.S. Fish and Wildlife Service (FWS) estimates there may be as few as 120-230 adult panthers left in South Florida. 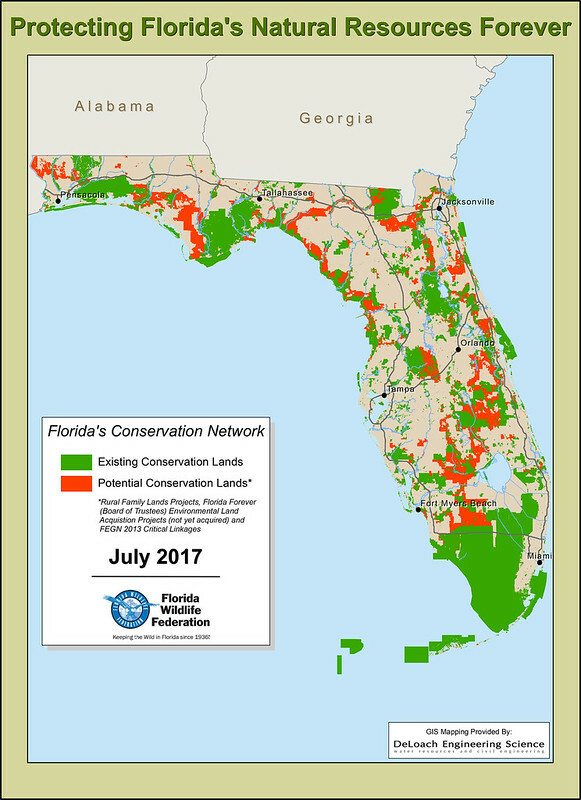 371 Florida sportsmen and women delivered a letter to members of Florida’s congressional delegation today calling on them to support full-funding and reauthorization for the Land and Water Conservation Fund (LWCF). The August 2018 edition of Car and Driver features an informative and beneficial primer on wildlife crossings titled “Roadkill.” The Florida Wildlife Federation has an ongoing campaign to secure wildlife crossings across Southwest Florida and to promote habitat connectivity among the region’s public and private conservation lands. With increasing human growth and development patterns, our Southwest Florida office has a focus on comprehensive land use planning and limiting transportation impacts on wildlife. In recognition of the extraordinary generosity of philanthropists Sam and Betty Shine, the Florida Wildlife Federation (FWF) has expressed their deepest thanks. The Shines have recently donated a critical tract of land, over 6,000 acres in size, to the St. Marks National Wildlife Refuge south of Tallahassee on the Gulf of Mexico. This is just the latest Florida conservation project that the Shines have aided in. U.S. Fish and Wildlife Service is presently reviewing the status of our iconic Florida Panther. SUPPORT MARINE FISHERIES! SUPPORT OUR MENHADEN! The future of menhaden, a critical forage fish species, is being decided soon. The Atlantic States Marine Fisheries Commission (ASMFC) has released menhaden draft Amendment 3 for public comment.